This week I fell in love with my coaching business all over again. What can I tell you? It happens. To what do I attribute this? At the moment I think it may have something to do with Marianne Williamson’s book The Law of Divine Compensation: On Work, Money and Miracles but I’ll let you know as I go on with the book if I’m on the money with my theory. Earlier in the week I saw and shared this quote on Facebook. 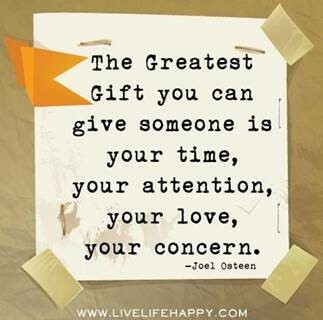 I have always believed that the greatest gift I can give someone is my time, my attention, my love and my concern. And these are just some of the things I bring to my coaching and mentoring work, and to my relationships beyond my work come to that. What is the greatest gift you bring to your work? And what causes you to fall in love with your business all over again?